The blunt-end design for the Command Module was chosen to build upon experience gained with the similarly shaped Mercury and Gemini spacecraft. The spacecraft reentered the atmosphere with its protective heat shield facing forward. Layers of special "ablative" material on the shield were purposely allowed to burn away during reentry to help dissipate the extremely high temperatures caused by atmospheric friction. 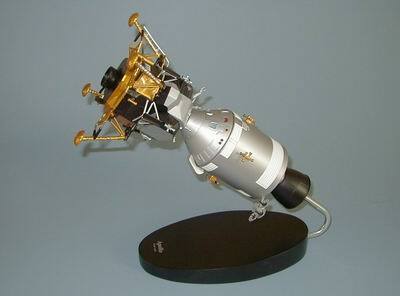 The NASA "Eagle" made history when it became the first manned object to land on the moon. It carried two astronauts to the moon's surface and returned them to the command module for their return to earth. Plastic and resin. Scale: 1/48. Width 5 3/4 inches, Length 14 inches.